With the House poised for a nail-biting vote to raise the debt ceiling and avoid a U.S. default, Republican House Speaker John Boehner and Democratic Minority Leader Nancy Pelosi both voiced confidence the bill can pass, despite significant public opposition from within their parties. 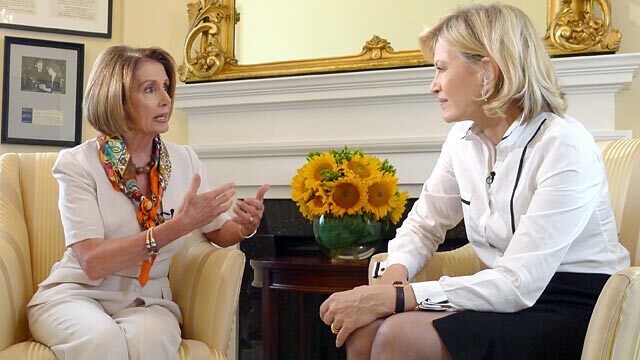 In an interview with ABC News' Diane Sawyer, Pelosi said she will "absolutely" vote yes on the compromise package, even though she agreed with one colleague who called it a "Satan sandwich." "It probably is – with some Satan fries on the side," Pelosi said. Still, Pelosi said she's supporting the deal – and believes a sufficient number of House Democrats will follow suit – because it meets three key criteria: it extends the debt limit for 18 months without any cuts to Social Security, Medicare or Medicaid, and it establishes a balance of cuts between discretionary spending and defense. Republican aides said Pelosi will need to secure at least 70 Democratic votes for the bill to pass – an outcome that is far from certain. "Where they have their comfort level, that's where they'll vote," she said of her colleagues. But when asked if it will be necessary for President Obama to come to Capitol Hill to urge Democrats to vote yes, Pelosi said, "that won't be necessary." "We have to get this over with," Pelosi told Sawyer. "We have to get to work putting people back to work. We've got to get on with job creation. Every day we were stuck on this negotiation we weren't doing everything in our power to create jobs. So that's where we have to go." In an earlier interview with Sawyer, Speaker Boehner signaled he's confident the bill will pass even though many Republicans fundamentally oppose an increase in the debt ceiling, or one without simultaneous passage of a balanced budget amendment to the Constitution. "We got there, but we got to get the bill passed and I think we will. But so far so good," Boehner told Sawyer. "I understand that some people want more. I'd like to do more. It's not perfect," he said, "but it is a good step in the right direction." After the vote, which could come as early as tonight, where does the speaker expect to be tomorrow morning? "Hopefully hiding somewhere," he said.